New York is a city adorned with lights, brought to life by millions and millions of hopes and dreams from people who leave everything behind, their family, friends, and hometown, in search of making it all come true. These are the people I call “urban orphans”. I came to NY 10 years ago, arriving at 34th street and 10th Ave, with nothing but a suitcase full of excitement and expectations. It hasn’t been easy, but I wouldn’t trade if for anything. Likewise, in this melting pot, there’s a story similar to mine everywhere I turn. The holidays are the time we feel the most homesick. Over the years, I’ve spent Thanksgiving at several friends’ homes (very gracious of them), but honestly the sight of an entire family sharing, laughing and eating together, makes me miss home that much more. I love shopping, and I love food, so getting both fixes in one day is a total indulgence, next to a day at the spa. Century 21 Department Store use to be “NY’s Best Kept Secret”, this was 10 years ago, now, every tourist knows about it, it’s in every guide book, yada yada yada. The NYC store looks like a tornado just went by, with so many people in one store, I usually feel suffocated, that’s not a good way to shop. Thank goodness for Westbury, Long Island. This store is spacious, with high ceilings, good variety, organized, great price, but most importantly, less people! An inviting stroll down racks of Designer Brands at Walmart prices (ok, maybe not that cheap, but you get the idea). After hours of shopping (my preferred exercise, hehe) I like to fill my tummy with an homey Italian meal at Mama Theresa’s, which is a couple steps away, both in the same complex. This is like a Combo, can’t go to one without the other. 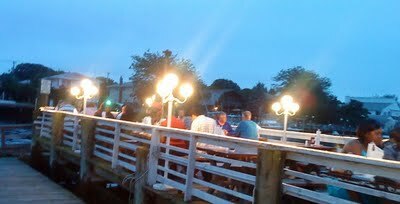 The first time I went to Bracco’s was on a hot summer afternoon, for an early dinner. We had spent the day at Jones Beach for my friend Cindy’s Beach Baptism, so to celebrate her big day and to welcome her to our big Christian family, we took her out for a seafood feast in Freeport. The weather was great, and the food was awesome. Freeport reminded us of being on a small street in the Capes, somewhere outside of NY, and Bracco’s was very casual and laid back, shorts, tanks and flip flops kind of place. There’s nothing like walking into a restaurant, and feeling like your going to a friend’s for dinner. Mara greets you as you walk in the first of two very small and cozy dinning areas. Sometimes you’ll see her husband and daughter helping out and the waitresses are always super friendly and helpful. 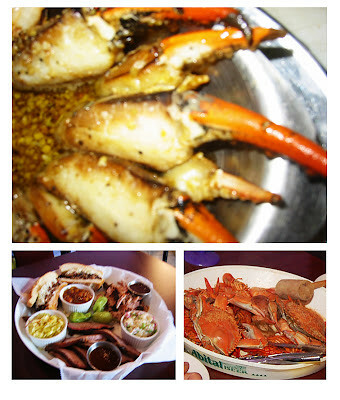 The menu includes Cajun Style Seafood, BBQ & Southern Comfort Food. For the more adventurous, the fried gator bites are marinated in Cajun spice, crunchy and tender, if you’ve never had them, i’ll say give’em a try. It’s sorta like a cross between fish and chicken. I’m no Andrew Zimmern (host of my beloved Travel Channel’s, Bizarre Foods) when it comes to food, but I’m open to trying new things and i really love the texture and flavor of these bites.